Pasiphae, in Greek mythology, was a queen and a sorceress, and was closely associated with the island of Crete. Today, Pasiphae is best known as the wife of King Minos of Crete, and for being the mother of the Minotaur. Pasiphae the daughter of the god Helios and the Oceanid Perseis (Perse); making Pasiphae sister to Circe, Aeetes and Perses. Pasiphae was said to be immortal, just as her sister Circe was also immortal, although her brothers, Aeetes and Perses certainly weren’t. The females in this family-line were known for their skills with potions and herbs, for as well as Pasiphae and Circe, the sorceress Medea, the daughter of Aeetes, was also part of this family. Pasiphae would only come to prominence upon the island of Crete, for there, Pasiphae would become wife of Minos, a son of Zeus and Europa; and therefore Pasiphae would become Queen of Crete when Minos ascended to the throne after the death of his stepfather, Asterion. Minos though was not a faithful husband, and to try and stop her husband’s infidelity, Pasiphae would concoct a potion that transformed the king’s sperm into poisonous creatures such as scorpions and millipedes. Any lover of Minos would thus perish, although Pasiphae, as an immortal was impervious to the poison. The potion of Pasiphae also meant that Minos could not father any children, but this was remedied when Procris arrived upon Crete. 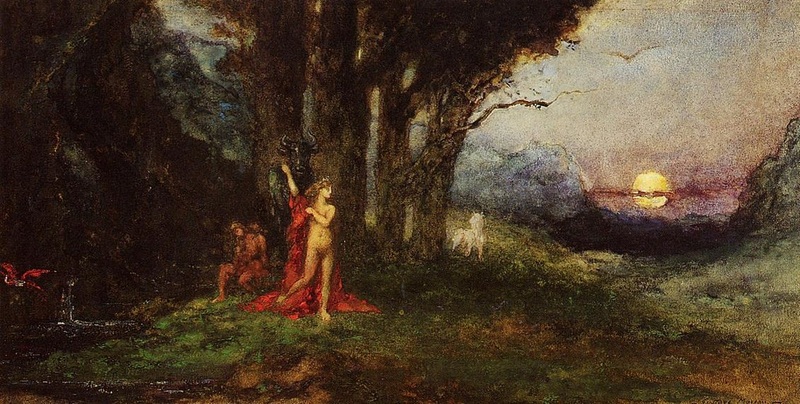 Now either, Procris was simply looking to be rewarded for her work, or else she wished to become a lover of Minos, but in either case, Procris devised a counter-potion from Circaean root. ​King Minos would reward Procris by presenting her with Laelaps, the hunting dog who always caught its prey, and a javelin that always hit its targets, gifts that had previously presented to Minos’ mother, Europa. Pasiphae is best known for her own infidelity, rather than those of her husband, although this infidelity was caused by King Minos. To gain the throne of Crete Minos had prayed to Poseidon, who had dispatched a magnificent white bull as a sign of the god’s favour. Minos was expected to sacrifice this bull, now known as the Cretan Bull, to Poseidon, but Minos was so taken with the white bull that he kept it instead. An affronted Poseidon decided to have his revenge by causing Pasiphae to fall in love with the bull, a love in the real physical sense, for Pasiphae would lust after the bull; and the skills of the sorceress were not enough to counteract the curse of Poseidon. Pasiphae would eventually to enlist the help of Daedalus, the master craftsman, to sate her unnatural desires. Daedalus would manufacture a lifelike wooden cow, with real cowhide covering it. Pasiphae would enter the wooden construction, and after it was wheeled out into the field, the Cretan Bull would mate with the wooden cow, and Pasiphae inside it. After coupling with the Cretan Bull, the desires of Pasiphae would be sated for ever, but the coupling also meant that Pasiphae was pregnant with a son. This son would upon his birth be named Asterion, after the former king of Crete, but this son was no ordinary boy, for he had the body of a man, but also the head and tail of a bull, and thus Asterion would become better known as Minotauros, the Minotaur. As a baby, the Minotaur would be nursed by his mother Pasiphae, and even as a young child, the Minotaur would be given free reign of King Minos’ palace. ​As the Minotaur grew older though, he would become more savage, and it was no longer safe for Pasiphae or other members of the royal household to be around him. Daedalus was tasked with creating a new home for the son of Pasiphae, and so the Minotaur’s new home would become the gigantic labyrinth beneath the palace. Acacallis – the daughter of Pasiphae and Minos, Acacallis would be the mother two founding heroes, for she born Cydon, founder of Cydonia, to Hermes, and Naxos, the founder of Naxos, to Apollo. Androgeus – the son of Minos and Pasiphae, Androgeus was the king’s favourite child. Androgeus was killed whilst in Athens, and as a result Athens would have to pay tribute to Crete. Ariadne – the most famous daughter of Pasiphae, Ariadne would assist Theseus when he entered the Labyrinth, and would flee Crete with the Athenian. Later though she would be abandoned and would end up as wife of Dionysus. Catreus – Catreus was a son of Pasiphae and king of Crete after Minos. Catreus would be killed by his own son Althaemenes, just as a prophecy had declared. Deucalion – Another son of Pasiphae and Minos, Deucalion was occasionally named amongst the Argonauts, and also he is occasionally said to have become king of Crete, whilst others say he was killed by Theseus whilst Minos was still alive. Glaucus – Glaucus was a son of Pasiphae, who as a child was found dead inside a cask of honey, but was subsequently brought back to life by the seer Polyidus. Phaedra – whilst Ariadne was abandoned by Theseus, another daughter of Pasiphae, Phaedra, was said to have married him. The story of Pasiphae effectively ends with the birth of her children, for she is subsequently not mentioned in the Greek myths that have survived.